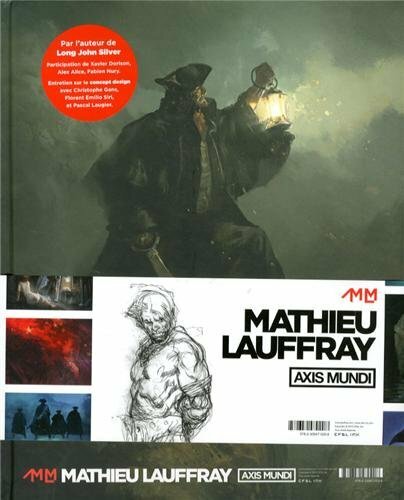 Axis Mundi is the artbook of the talented Mathieu Lauffray. He's an illustrator, comic artist, concept designer and storyteller. You'll see the various work he has in the book. It's a 240-page hardcover. There's quite a bit of text but they are in French only. I see several names so they should be interviews by other artists on Mathieu Lauffray and the projects. Axis Mundi, in mythology, is the world centre or the connection between Heaven and Earth. Featured in the book are work from films such as The Tall Man, Saint Ange, Warner Bros' 10,000 B.C., Lord of the Apes (cancelled) and comics such as Prophet and Long John Silver and Chroniques De Legion. The art is fantastic. The environment art for 10,000 BC and Lord of the Apes are wonderful. This guy can really paint and design. Mathieu Lauffray has a very nice style for comic art as well with the strong blacks and textured line art. Very bold and striking. There are several comic panels and rough sketches included. The art pieces are printed satisfyingly large. Even if you can't read French, it's still a highly recommended artbook. That looks like a must-buy for me once I get the funds :) Thanks for showing the art of this artist I hadn't heard of before. His drawings really remind me of Claire Wendling's drawings though...I wonder if they studied at the same art school or something.